Posted on 30, August 2016 by EuropaWire PR Editors | This entry was posted in Automotive, Entertainment, Germany and tagged 16th smart times, Germany, Hamburg, smart enthusiasts. Bookmark the permalink. Hamburg/Stuttgart, 30-Aug-2016 — /EuropaWire/ — Roadster, coupé or cabriolet? Petrol engine, diesel engine or electric drive? Two- or four-seater? Special or standard model? The variety of smart vehicles is endless – as impressively demonstrated by the 3.167 smart enthusiasts from around the world who attended the 16th smart times, the first to be held in Germany. The worldwide smart fan community gathered in Hamburg to celebrate the cult brand between 26 and 27 August 2016 and transformed the city’s wholesale market into a festival of the urban lifestyle – with music, street food, a smart flea market and a test track and a visit of the two beach volleyball “golden girls” Laura Ludwig and Kira Walkenhorst. 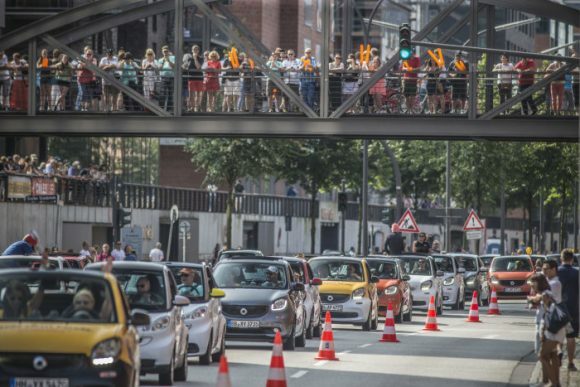 The highlight was the traditional closing parade, in which 1,635 smart vehicles were driving through the streets of Hamburg one after another. That is not just a lot: that is the new smart times record which beat to current high of 1,427 vehicles two years ago at the smart times in Cascais, Portugal. Next year, the Spanish city of Salou has the chance to set new records as this is the place where the smart times 2017 will open its gates for the smart community. Since 2001 this unique gathering has drawn smart enthusiasts from around the world to a different European city every year. Over the course of a weekend fans are able to share their enthusiasm for the perfect city car and the spirit of the brand, chat to designers, tuners and experts, explore the city together, take part in excursions and listen to various live music acts. This year’s smart times in Hamburg wowed fans with test drives of the latest smart models, details of new services such as “smart ready to drop”, outings to the beach at Sankt Peter-Ording, an exciting test track, evening parties and live appearances by local and international artists. A special appearance and surprise was made Friday evening when the German beach volleyball duo Laura Ludwig and Kira Walkenhorst drove on stage with a golden smart fortwo cabrio. Subsequently, the fans were able to get autographs of the two “golden girls”. Throughout the event, participants and interested locals flocked to the area around Hamburg’s wholesale market, which became a showcase for automotive passion and creativity. From a “popemobile” smart to one in shocking pink or wood look to a fiery motor racing or a versatile off-road smart: 2,053 vehicles on site impressively demonstrated the endless possibilities when it comes to individualising the cult car. The highlight, as every year, was the smart parade on the Saturday. A parade of 1,635 smart vehicles made its way through the city, cheered on by locals. At the closing event on Saturday evening, especially the smart fans from Spain had another reason to celebrate: next year the worldwide fan community will be heading there to the city of Salou for another weekend of celebrations in honour of the little city runabout.